Andy Warhol suggested that one day, everyone would be famous for 15 minutes, but at the Tour de France Rinaldo Nocentini stretched his moment out to eight days. Depending on your viewpoint, the middle week of the Tour might have been seen as a bit of a yawn. Mark Cavendish would disagree, and so would Nocentini. For the Italian, the journey between Arcalis, in the Pyrenees, and Verbier, in the Alps, were the best days of his life, when the cycling Gods paid him back for years of near anonymity in professional cycling. “Some people might say I was lucky, that I was just in the right place at the right time, in the right break on the right stage,” he tells Cycle Sport. “Perhaps. But I believe in destiny,” he continues. Destiny gave Nocentini another helping hand on stage seven from Barcelona to Arcalis, in Andorra. After a poor first half of 2009, in which they won only three races, Nocentini’s Ag2r team had performed well in the team time trial, finishing ninth, 1-48 behind Astana. He was eighth in the uphill sprint to Barcelona and lay 32nd overall, only 3-13 behind Fabian Cancellara, when the Pyrenees loomed on the horizon. Ag2r team manager Vincent Lavenu quickly realized Nocentini had a chance of yellow or at least a stage win, if the overall contenders let the break go and then hesitated on the climb to the finish. Nocentini made sure he was in the move that went clear in the rain on the hills outside Barcelona. The break quickly opened a ten-minute lead and Nocentini was ‘leader virtuel’ of the Tour de France. The trick was how to turn ‘virtuel’ into real. Nocentini encouraged the other riders with a few strong ‘Allez, allez.’ Lavenu had also played a clever tactical game by getting team-mate Christophe Riblon into the break, and he worked generously to keep the gap high. Brice Feillu (Agritubel) attacked with six kilometres to go and stayed away to win the stage but Nocentini was focused on taking the yellow jersey. Like a carrot dangling on a stick before him, the image of the yellow jersey was before his eyes, and he went for it, hard. “With five kilometers to go I knew that I had a chance of getting the jersey and so I totally focused on that,” he says. It meant Nocentini became the 24th Italian to wear the yellow jersey. Ottavio Bottecchia was the first way back in 1924, with Alberto Elli the last in 2000. Six seconds is virtually nothing but it was enough for Nocentini. The finish in Arcalis had raised all the big overall contenders to the top of the general classification but none of them wanted the burden of wearing yellow so early in the Tour. Nocentini knew that if he could get over the Col du Tourmalet, the final climb of the Pyrenees, and finish with the leaders, he’d wear yellow all the way to the Alps. “It was the longest climb of my life but I made it,” he says. “On the climb I was close to Andy Shcleck and Contador and then I followed Armstrong down the descent, almost as if he was my domestique,” Nocentini says. After the Tour left the Pyrenees and headed north, via Limoges to Issoudun, Saint Fargeau and Vittel, Mark Cavendish collected stage wins, while Nocentini collected days in yellow. Ag2r shared the work on the front of the peloton with Cavendish’s Columbia squad. They also shared the glory. Each day was another huge bonus for the Ag2r team. And each day made their awful new brown and white colours more palatable. Vittel. Six days in yellow, and Nocentini equalled the record of 1998 Tour winner Marco Pantani, Mario Cipollini, Italo Zilioli and Vito Favero. The cold and wet conditions in Colmar the next day limited the attacks. That took Nocentini to seven days, matching Learco Guerra and Francesco Moser in the all-time list of Italian yellow jersey wearers. It almost went wrong the next day, when George Hincapie missed snatching the jersey by five seconds after a controversial chase by some rival teams, but destiny favoured Nocentini again. Eight days in yellow. Just like his hero Claudio Chiappucci. “Chiappucci was crazy when he attacked in the Tour but I loved the way he went for it,” Nocentini says. The end was in sight, and it came, as expected, on the climb to Verbier on stage 15. He didn’t even try to hang on when the Tour favourites detonated the race. Contador romped away at twice the speed, while Nocentini wisely paced himself. There were no more heroics for the Italian, but conservative riding allowed him to finish 14th in Paris. “I tried not to get used to wearing the yellow jersey too much because I knew I’d lose it one day and didn’t want it to hurt when I did,” he says. Wearing the yellow jersey elevated Nocentini to the level of national hero, especially in a Tour which was otherwise quiet for the Italians. Nocentini ‘in giallo’ was front page news and the appreciation for how he managed to hang on to the yellow jersey day after day was huge. Nocentini’s nickname of ‘Noce’ – Walnut in English, was all over the papers. And his fan club changed their slogan from ‘The walnut will give its fruit’ to ‘The walnut has given its fruit’. He will not be remembered like Pantani or Moser but the millions of Italians who read Gazzetta dello Sport at the bar every morning, all cheered for Nocentini. Whenever an Italian succeeds in France, it helps Italians shrug off the inferiority complex they have with their so-called ‘transalpini’ cousins. Nocentini in yellow was as moment of national pride, like Italy beating France in the 2006 football world cup final. Even Italian Prime Minister Silvio Berlusconi was grateful because Nocentini helped take some of the spotlight away from the scandals surrounding his private life. Nocentini is a bit naïf with his blond highlights, mop top haircut and chunky earring. But his love for a bit of karaoke and a nice glass of red wine made him one of them. Nocentini comes from the very heart of Tuscany, from the small village of Montemarciano, south of Arezzo. The area is now known for the Chianti vineyards, spectacular rolling hills and expensive country estates but Nocentini’s grandparents were poor farmers. His dad was a builder and his mum a housewife who was kept busy bringing up their ten children. “I’m the ninth out of ten,” Nocentini says with a smile. “Our house was always open to everyone although it was often a race to get a place at the table. With so many of us we didn’t have a penny but we were happy together. Rinaldo’s older sister Daniela died during the 2008 Giro d’Italia after a long illness and his mother has also passed away. He dedicated his eight days in yellow to both of them. In the late nineties Nocentini was considered the next big thing in Italian cycling. He was third in the junior road race world championships in San Marino in 1995 behind Valentino China and Ivan Basso and then dominated the amateur scene in Tuscany. He was the star at Grassi-Mapei, which acted as a feeder team for the Mapei professional team, and was probably earning more than his father when he was only 19. He helped Italy dominate the world under-23 championships in 1998 in Valkenberg, coming second, while Ivan Basso won the world title and Danilo Di Luca was third. That guaranteed him a place at Mapei for 1999 but while other talented riders like Fabian Cancellara and Filippo Pozzato bloomed, he struggled to fit in. “With hindsight, I think joining such a big team was bad move for me,” he says. After three years, and no wins after those in Langkawi, Nocentini left Mapei and joined Fassa Bortolo, under the management of Giancarlo Ferretti. But Ferretti ran his team like an aggressive sergeant major. “Ferron knew I had talent but after three or four months things got difficult. I got on with my team-mates but it was a nightmare with him. We were like chalk and cheese,” Nocentini says. Nocentini rode for Acqua & Sapone for four years between 2003 and 2006. He picked up the odd win and played a key role in helping Paolo Bettini win his first world title in Salzburg in 2006 but there was a feeling he was letting his career slip away. He was never a great fan of going training, with even his wife admitting she often pushed him out of the door in the mornings. Fortunately she also pushed him to join Ag2r in 2007. Nocentini could have found a place in a big Italian team after the world championships but he had already signed with Ag2r and had started learning French. Few Italian riders move to French teams and even fewer succeed but Ag2r is perhaps the least ‘French’ team of all, with almost half of the 30-rider team coming from other countries. “Ag2r really believed in me. They first showed an interest in the spring, at Milan-San Remo and liked that,” Nocentini says. Joining Ag2r probably saved Nocentini’s career. He could have become entangled in the murky waters of the small Italian teams, where the doping culture is still rife and wages are often paid in cash, if at all. Instead he chose a safer but less trodden route. He had to learn a new language and fit in with French cycling culture but he knows he made the right decision. Destiny paid him back with an unforgettable week in this year’s Tour de France. While most riders head home as soon as possible after the Tour de France, Nocentini headed straight to the criteriums to cash in on his eight days in yellow. He planned to ride Clasica San Sebastian and then more criteriums before finally heading back to Tuscany for a big family celebration. Gazzetta dello Sport suggested that Nocentini left for the Tour as a boy but will return home a man. He agrees. 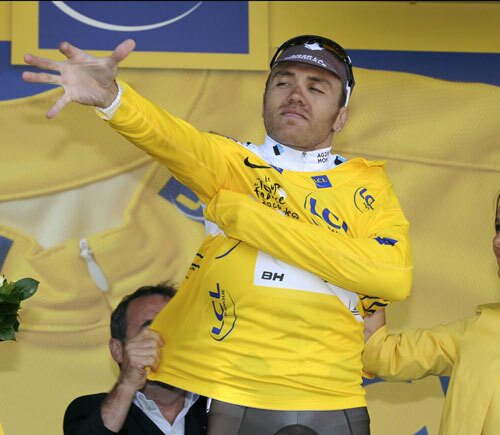 “While wearing the yellow jersey I had time to think about my career,” he says. Like a lot of professional rider’s Nocentini loves his tattoos. Tour de France. Of these, six have also won the Tour.